The Dharma Chakra (also known as the wheel of Dharma) is a symbol from ancient India and one of the Ashtamangala of Hinduism, Jainism, Buddhism. 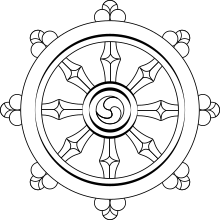 The Dharma wheel symbol has represented Buddhism, Gautama Buddha's teachings and his walking of the path to Enlightenment since the time of early Buddhism. The symbol is also connected to the Four Noble Truths and the Noble Eightfold Path. the wheel that from the first has always been pure. This page was last edited on 24 March 2019, at 01:28.